In the early days of Major League Soccer, rivalries between fans were few and far between. At best, fledgling feuding began between the few geographically close sides like New York and Washington. At worst, the rivalries were completely ceremonial — think of the largely pointless Trillium Cup between Columbus and Toronto or the Brimstone Cup played between Chicago and Dallas — or even non-existent. And for a league looking to establish itself, the lack of natural rivals for fans to unite against was a major hurdle to MLS’ success in growing an invested fanbase. Rivalries, after all, breed passion. And passion breeds season ticket buyers. And season ticket buyers breeds eventual profits and sustainability. So fostering that kind of mutual competitive spirit between groups of supporters ultimately became a major focus for the league office. Flash forward to today, and thanks to league expansion, aggressive marketing and organic growth, real-life rivalries abound in MLS. The integration of the long-standing Cascadia Cup — battled out between Portland, Seattle and Vancouver for — into the league is probably the best known and most passionate of the lot. But others like the Texas Derby between Dallas and Houston, Red Bulls and Union out East and even the Crew and Fire have blossomed into vibrant and passionate affairs over the last few years. One of the biggest improvements these budding rivalries provide is to matchday atmosphere that the two “battling” factions provide. And since Chicago were making the trip down to Columbus — a stadium I recently got up close and personal with — I thought it was the perfect time to go and see just how intense things have gotten between the two loyal sets of supporters. Chicago, to pay them proper tribute, were one of the first clubs to truly embrace the supporters culture within MLS. Fostered and encouraged on by former Fire and current Indy Eleven president Peter Wilt, Section 8 Chicago have been organizing group away trip outings for well over a decade. I personally have memories of buses full of Fire fans pulling up to Crew Stadium that date at least as far back as my early years in college. 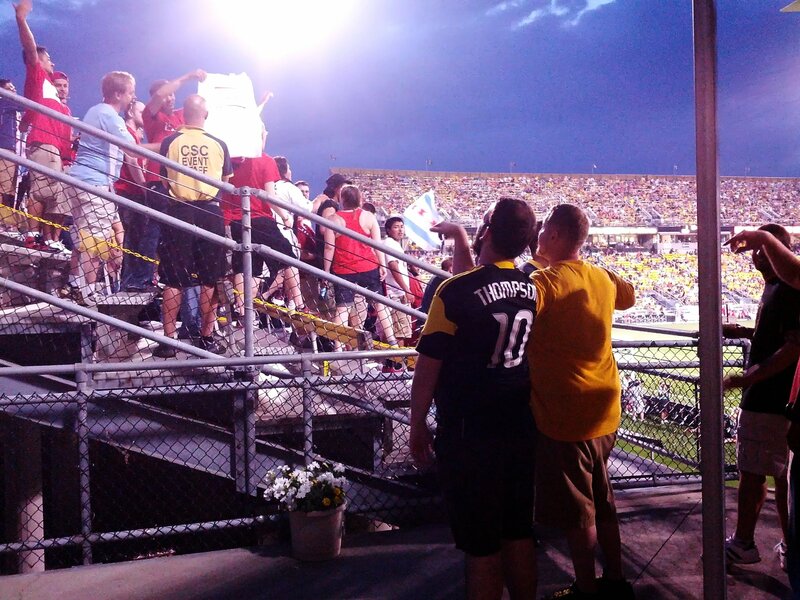 The Crew’s own supporters sections — located in the Northwest corner of Crew Stadium and affectionately known as the Nordecke — may have had a slower start than their counterparts in Chicago, but they’ve come a long way since. 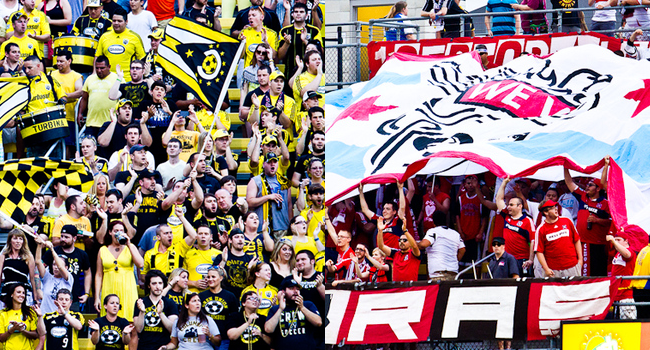 At least four separate groups now call the section home (Crew Supporters Union, Hudson Street Hooligans, La Turbina Amarilla and the Buckeye Brigade), with each offering their own unique spin on supporting the Black & Gold. Numbers have swelled and their collective voice has grown louder. So when I made the trek north to Columbus last weekend, I was excited to see what each section would be bringing to the table. A smaller Chicago contingent than is normal made the trip down — maybe a hundred or so, compared to years past where it was as high as 300 — but it didn’t seem to make much of a difference. Despite their smaller numbers, Chicago’s Section 8 and Sector Latino provided a very audible showing: drums, horns and a whole lot of screaming constantly emanated from their small corner of the stadium. And I’d wager that a good chunk of their energy was spent taunting the home support. Chants ranged from a tame “This is our house!” to a far more explicit rip off of the Crew’s normal “Yellow Soccer Team”. this clever tifo is a great example of what “friendly banter” should be like. However, the Nordecke had no intention of being out done. Banging their own drums, they too tossed barbs at the visitors from the opening whistle, crescendoing around Federico Higuaín’s 7th minute penalty. The standard — yet enjoyable — “Piss on the Fire” spilled out from all around the stadium, proving that the Crew supporters section could also get a season high crowd of 19,624 fans to join in on their taunting. Further efforts to frustrate the travelers included the excellent tifo to the left, hung directly facing the Chicago fans. However, two goals in three minutes for the Fire just after halftime turned the match on its head. And despite the Crew bossing most of the possession throughout the remainder of the match on the pitch, they were never able to capitalize. And it was about the same time as those two goals when things in the stands quickly morphed from a spirited rivalry to a small but ugly affair. While most of the visiting Fire support throughout the match could be classified as “friendly banter”, there were predictably a few bad apples sprinkled among them. Several times I was flipped the bird while taking pictures of the group for this piece, with some choice words aimed my way in the process. But the insults hurled after each goal were far worse, with some homophobic slurs directed towards the small group of Crew fans standing along the railing in the neighboring Upper 90 Club. Unfortunately though, it wasn’t just those few naughty Fire fans who were causing all of the problems. Moments after the goals, a handful of indignant Columbus supporters appeared on the scene with nothing but trouble on their agenda. They proceeded to rile up the already feisty Fire supporters, slinging cheap shots of their own. I overhead multiple invitations to settle things in the parking lot issued by both parites, though I didn’t catch wind of any altercations post-match. Things ultimately got so heated that it necessitated a steward to get in between the two sets of supporters, and a few police officers arrived to keep an eye on things. And while I’d love to say that things cooled after the final whistle, unsavory and highly offensive discourse continued on afterwards in a Facebook trash talk group. 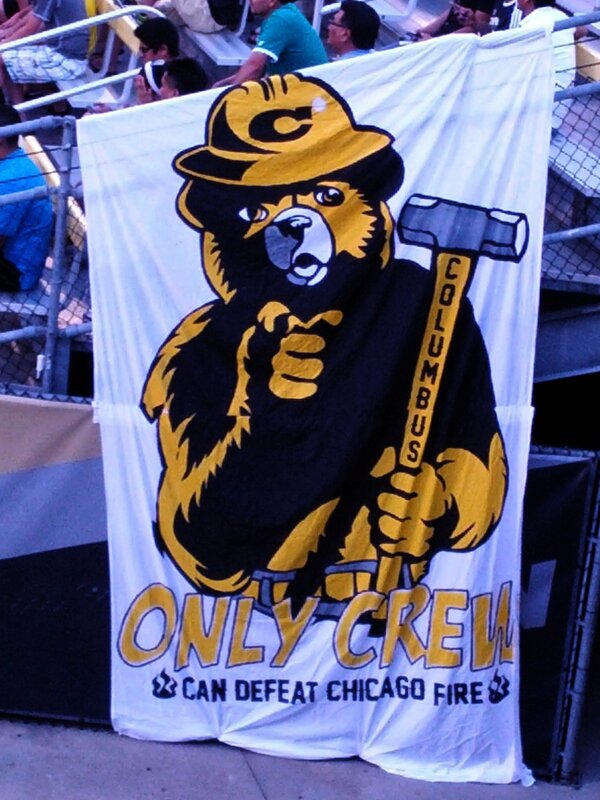 was it really necessary for these crew fans to show up and taunt the traveling fire fans? nope. Couple that with apparent internal conflicts within the Nordecke, constant negative (yet correct) calls for the sacking of Columbus manager Robert Warzycha, and even chants of “Hang the Referee” further soured the mood of what should have been a really enjoyable evening… regardless the result. So what does all this mean? Well for starters, let’s not make this entire thing all about the negatives. MLS supporter culture has grown tremendously over the last five years, and in nearly every case it’s made for a noticeably better match atmosphere both in person and on television. I wouldn’t trade what we have now for the days of old in a million years. Nor do I want it to seem like I’m publicly shaming either group of supporters. On the whole, they both do wonderful and incredibly important work in building MLS and their clubs. Look, there is nothing wrong with cheering on your team, having passion for your club, or expressing your feelings about the game/management/etc. But there is still a clear line between supporting and being offensive. And for fans who can’t tell the difference between the two, maybe a ban would be enough to remind them? Probably not, but it’s a place to start. Left unchecked, negative support like this could lead to bigger and uglier encounters. And though I know that clubs and supporters groups alike are very proactive in policing their own, last Saturday in Columbus shows that there’s still work to be done.